The Yazwinski Clan: My Grandparents...so cute! I just love this guy!!! He is the best grandpa a girl could ask for...he is so proud and can you BELIEVE the size of that thing!!! 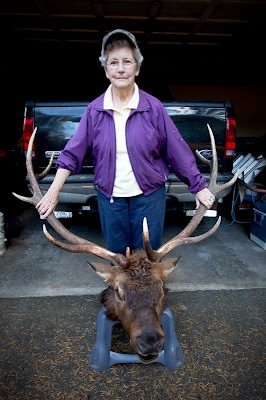 My sweet grandma posing with my grandpas kill. Ok, I know I haven't posted in forever, but I had to add these so Stella could see them one day. I promise I will post the Halloween party, halloween and fall festival later this weekend. But this is about my sweet grandparents. 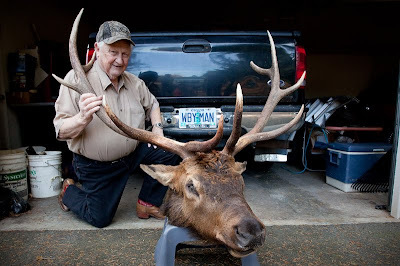 They have gone elk hunting in Oregon for as long as I can remember and this year was no different EXCEPT...my grandpa killed this massive BULL! That's a big deal for lifetime hunters :) I wont post the entire story of the size and getting out of camp, but just know he is very proud! Love you Mommom and Pa!